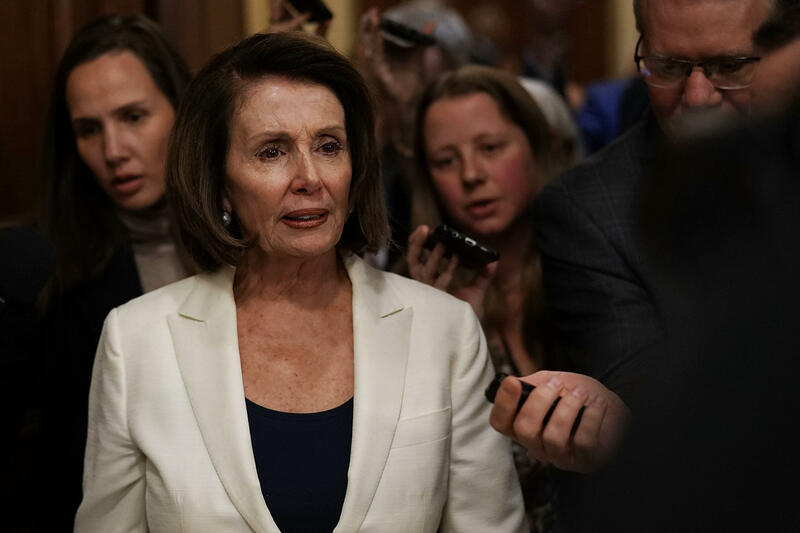 An ongoing feud over who will lead House Democrats next year is poised to enter a new round as early as next week, as members eager to oust House Minority Leader Nancy Pelosi, D-California, are floating a new way to do so. The latest attempt — which senior leadership aides anticipate will be futile — once again exposes that a handful of House Democrats remain concerned about whether Pelosi is dragging down candidates locked in competitive races that the party needs to win in order to gain control of the House. This group of anti-Pelosi Democrats is seeking to change the way the caucus elects its top leader. On Wednesday, these members submitted a way to tweak the byzantine procedural rules governing the makeup of the caucus. Current House Democratic rules require that their leader win a majority of the caucus in order to secure the job and be put forward as a candidate to the full House to serve as speaker. Democrats and Republicans put forward candidates for House speaker at the start of a new two-year session. Given the math, the majority party's candidate always wins and becomes speaker. If the Democrats fail to retake control, their new leader would require just a majority of voting members. The group of 11 Democrats who signed the letter today included Rep. Ed Perlmutter (Colorado), Rep. Kathleen Rice (New York), Rep. Brian Higgins (New York), , Rep. Seth Moulton (Massachusetts), Rep. Robin Kelly (Illinois), Rep. Bill Foster (Illinois), Rep. Filemon Vela (Texas), Rep. Tim Ryan (Ohio), Rep. Marcia Fudge (Ohio), Rep. Albio Sires (New Jersey) and Rep. Kurt Schrader (Oregon), according to a Democratic aide who has seen the letter. Rice said in a statement, "It's no secret that I think our caucus needs new leadership. But more than that, I think we should have a process that fosters consensus, gives each member a voice and affords prospective leadership candidates a genuine opportunity to make their case before their colleagues. That's precisely what this proposed rule change sets out to do." Fudge said that her decision to support the rules change "has nothing to do with Nancy Pelosi. It is simply good policy. Instead of making the decision on the House floor, we can come out of caucus knowing who gets the vote - no matter who the Speaker will be. We choose not to be embarrassed on the floor the way the Republicans were embarrassed." A spokeswoman for Perlmutter said that "Ed is one of a number of members who sent this letter to the Caucus Chair to better align the Democratic Caucus rules with that of the House and ensure the Caucus is ready to hit the ground running come January 3, 2019." Other senior leadership aides, who have endured similar leadership challenges in the past, privately doubt the new proposal will secure enough votes from House Democrats to succeed in part because members will want to wait and see the results of November's elections. Other aides noted that similar discussions over how to oust Pelosi have been ongoing for several months across Capitol Hill. "With less than 50 days until the election, if you aren't focused on winning the House, you are helping Republicans," said a senior Democratic aide. In 2007, Pelosi became the first woman elected speaker of the House, and she already has a large group of vocal supporters within her party who say they value her decades of service and her cunning legislative strategy. But in late 2016, 63 House Democrats voted against her for leader — nearly a third of her caucus. In the wake of that challenge, Pelosi and her leadership team created more opportunities for younger colleagues to lead working groups on the caucus' messaging. But those members remain concerned — and Democratic congressional candidates nationwide have faced questions this year over whether or not they would support Pelosi for speaker. In August, Democrat Danny O'Connor narrowly lost a special special congressional election in suburban Columbus, Ohio. Observers pin his narrow loss partly on O'Connor's unclear position on Pelosi's future as Democratic leader. O'Connor ultimately called for a "new generation" of party leadership — as have other candidates. Pelosi continues to dismiss talk of another leadership challenge. "If I weren't effective, I wouldn't be a target," she recently told Time Magazine. "I think I have my pluses and my minuses," she added. "But I have a confidence about what I bring to the table in terms of my network of friends around the country. And I get things done, even with a Republican President." House Democrats are set to meet next Wednesday for their weekly private strategy meeting, helmed by Rep. Joe Crowley, D-New York, who was seen as a potential Pelosi successor but lost in a primary bid over the summer. The proposed change is slated to be a topic of conversation at Wednesday's meeting, according to a Democratic aide. Details of the proposed change were first reported by The Atlantic.